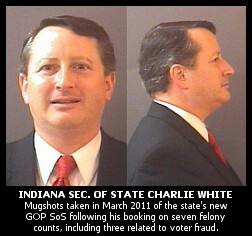 " Articles from: April 2011	"
Indiana's Republican Governor Mitch Daniels will not be able to appoint a replacement for the recently elected Secretary of State Charlie White, who is currently under indictment for seven felony counts, three of them --- ironically enough for the state's chief election official --- for voter fraud. On Wednesday, we updated the sad story of White, who is facing both a criminal complaint after being indicted by a grand jury as well as a civil complaint brought by state Democrats. The basis for both cases is tied to evidence that White used his ex-wife's residence for his voter registration and then knowingly voted at the wrong precinct (including for himself in last November's election), all while illegally serving on the Fishers Town Council despite not living in the town of Fishers. We initially covered the White story last month after the new Secretary of State was indicted, detailing the ever-growing list of top Republicans --- which now includes both GOP superstar Ann Coulter and Utah's former governor and possible 2012 GOP Presidential hopeful Jon Huntsman among others --- who are alleged to have committed felony voter fraud and voter registration fraud. The charges against White play out against the irony of the GOP's oft-echoed but ever-unsubstantiated charges of a "Democratic voter fraud" epidemic, claimed as a propaganda tool to support new voter suppression laws at the polling place. Indiana's own polling place Photo ID restrictions, instituted in 2008, are regarded as the most draconian and disenfranchising in the nation --- although they didn't serve to keep White from illegally voting. In our story earlier this week, we explained that White --- who has refused to resign amidst the scandal --- and the state Republican Party have been doing their best to slow-walk both the criminal and civil cases, in hopes of running out the clock until the state legislature could pass a law allowing Gov. 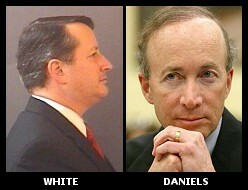 Daniels to appoint a new Sec. of State to replace White. Existing law, the Democrats argue, requires that the top vote-getter legally on the ballot in last November's election be named to the post. In this case, that would be the Democratic nominee Vop Osili. 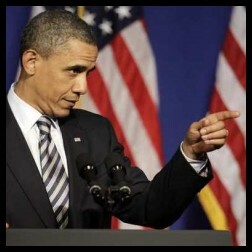 President Obama, Don't Just Scold the Media, Fix the Media! After revealing his "long form" birth certificate Wednesday, President Obama scolded the news media for letting this non-issue become a national obsession. Encourage Diversity in Media Ownership: Encourage diversity in the ownership of broadcast media, promote the development of new media outlets for expression of diverse viewpoints, and clarify the public interest obligations of broadcasters who occupy the nation's spectrum. Okay, let me connect some dots here. For more than two years, GOP extremists have made the President's birth certificate an issue that has successfully permeated the country's consciousness. According to a New York Times-CBS News poll last week, 43% of the country is not sure Barack Obama was born in this country, despite long standing factual evidence to the contrary. How did GOP extremists manage to make a non issue such a huge issue? They used the power of broadcasting to beat the drums of paranoia into 50 million people across our land. They used the power of talk radio, which they have used successfully tomarginalize Democrats and anyone else outside their narrow point of view. According to some little noticed 2010 press releases on the KKK's main website, which turned up this week on Reddit, it seems as if America's most famous hate group is actually very concerned about being mistakenly lumped in with other zealots on the right, including Koran-burning churches, the Westboro Baptists, and the Tea Party. There are without doubt Islamic sects that teach extreme views of Islam but, going down to their level of hatred by burning their books is a dangerous and ignorant way to confront their teachings. The flames made by such unholy fires never die out! 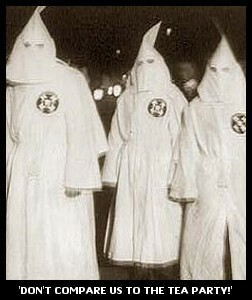 The Ku Klux Klan, LLC. opposes this most un-American thinking and activity. The Klan also says it "absolutely repudiates" the Westboro Baptist Church's practice of protesting at American soldiers' funerals, and, maybe most surprisingly, it says it's no fan of the Tea Party. "Our Associates, members and supporters are here officially ordered: NOT to attend Tea Party events or support them in ANY way," writes the Klan. "The Tea Party does not represent any but a shallow limited political agenda, which fails to serve our Nations interests. They are an extension of the Republican Party and seek to compromise it. We do NOT support any political party, all have betrayed the trust of the American people, and they have compromised their agenda to support the Progressive Socialist enslavement of the American people." 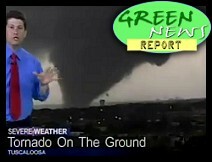 IN TODAY'S RADIO REPORT: Record storms kill hundreds across the South; Half the nation lives with dangerously polluted air; New rules for industrial waste dumps in your drinking water; PLUS: Big Oil fights to keep $4 billion in taxpayer subsidies, as near-record gas prices bring record oil industry profits ... All that and more in today's Green News Report! On my KPFK show (L.A.'s Pacifica Radio affiliate) today, I was joined by RadioOrNot.com's Nicole Sandler, fresh after her release from the Broward County, FL, Jail earlier today. She was asked to leave the meeting after asking questions about the GOP's attempts to end welfare as we know it. 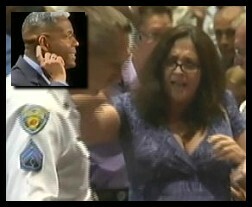 Nicole, who hosts her own progressive talk radio show and is the regular fill-in guest host for Randi Rhodes, was held overnight (several hours of it in solitary confinement, during which she was maced by guards), after her arrest at a Fort Lauderdale town hall event held last night by freshman "Tea Party" Republican Rep. Allen West (FL-22). Though she is a constituent of the insane Congressman, she was not allowed to ask questions, as West decided last night that he would take only pre-selected written questions. That, after town hall events have been turning into embarrassments for the GOP over the past week as they've faced questions from constituents angry about their recent vote to make drastic changes to Medicare by replacing the popular single-payer health care system with a voucher program. We covered the whole sordid affair earlier this morning in detail, including videos of the arrest, etc., as Nicole, my friend and colleague, was unreachable (still in jail) and her whereabouts were still unknown. In the time since our article concluded with a statement from her after she'd been released and I was finally able to speak to her by phone, and prior to my live KPFK interview with her, RAW STORY obtained and published the probable cause document filed by police along with her arrest. In the report, the arresting officer claims Nicole became "physically aggressive with this ofc., pushing me several times." The video footage we posted earlier today reveals no such physical aggression or pushing. During our interview, Nicole denied any such aggressiveness on her part, either during the arrest or in jail prior to her being maced by a Broward County jail guard. The show also includes a quick update at the top on the WI Supreme Court election "recount" which finally got under way across the Badger State earlier today. Wednesday morning at 9:00am Central Daylight Time, County Clerks in 72 counties across the state of Wisconsin will convene to oversee just the third statewide election "recount" in Badger State history. 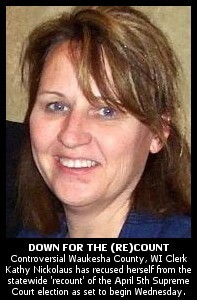 Kathy Nickolaus, the embattled Waukesha County Clerk, GOP activist, and former colleague of Justice David Prosser during their tenure in the Assembly Republican Caucus fraught with criminal felony charges and corruption, will not be one of them. The two previous statewide recounts in Wisconsin were carried out in 1989 and, before that, in 1865. By agreement of both campaigns, just 31 of the 72 counties will see some of their paper ballots counted by hand in the state-sponsored contest of the April 5th Supreme Court election between the incumbent Republican Prosser and his independent challenger JoAnne Kloppenburg. All other ballots are scheduled to be counted once again by the same oft-failed, easily-manipulated machines made by companies like Diebold, ES&S, and Sequoia, which tallied them originally. Each machine-tallied ballot may be examined --- though they may not be touched --- by representatives of each campaign, prior to being run through the machine again. Waukesha County --- where some 14,000 votes were said to have been discovered by Nickolaus as unreported Election Night --- resulting in a subsequent reversal of fortunes for Prosser, and a 7,316 vote lead in the unofficial, unverified vote count --- will see all of its paper ballots counted by hand. White represents just the latest in a series of high-profile Republican voter fraud cases --- including recent allegations against Utah's former governor, Jon Huntsman, a potential 2012 Presidential hopeful, and, of course, GOP voter fraud queen Ann Coulter --- most of whom have found some way to get off the hook entirely. 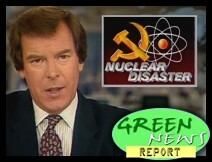 IN TODAY'S RADIO REPORT: April 26, 1986: the Chernobyl Nuclear Disaster, 25 years later; Japan's Fukushima nuclear disaster, six weeks later; Fracking blowout in Pennsylvania; Praying for rain in Texas ... PLUS: Speaker Boehner opens the door to eliminating taxpayer oil subsidies ... All that and more in today's Green News Report! 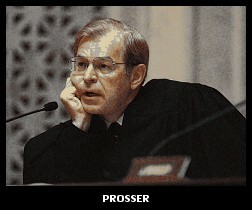 "This was a decisive election about judicial independence," WI Supreme Court Justice David Prosser said at a press conference in Madison last Monday, declaring victory and explaining his opposition to a recount of the April 5th Wisconsin Supreme Court election. "The people realized that judges should be much more than partisan politicians who wear black robes. Judges should be impartial in theory and in fact. They should faithfully apply the law without fear, and without favor," he told the assembled media. However, as an investigation by The BRAD BLOG reveals, there is a stunning gap between the lofty ideals of "independence" espoused by the incumbent Justice as quoted above, and the sordid reality of his own personal record as a hard-Right partisan official in Wisconsin, with the state's GOP caucus, and even during his role as a justice on the state's highest court. It is a reality, well-documented through court records and other sources, finding Prosser and his former Republican colleagues in the WI Assembly enmeshed in a criminal scheme to utilize state employees and resources at taxpayer expense in order to finance and organize WI GOP political campaigns. A reality which includes an astounding legal filing by this same sitting Supreme Court Justice in which he not only acted as an advocate for the accused, but even confessed to his own participation in the alleged crime. On Friday, a three judge panel of the U.S. Circuit Court of Appeal in D.C. reinstated a criminal case against four of five Blackwater (now known as "Xe") mercenaries who had been indicted for voluntary manslaughter in connection with the Nov. 16, 2007 massacre of Iraqi civilians in Nisur Square. The five guards, as reported by Reuters, were originally "charged with 14 counts of manslaughter, 20 counts of attempt to commit manslaughter and one weapons violation count over a Baghdad shooting that outraged Iraqis and strained ties between the two countries." The decision by the appellate court panel was unanimous and seen as "a victory to the U.S. Justice Department in a high-profile prosecution dating to 2008." 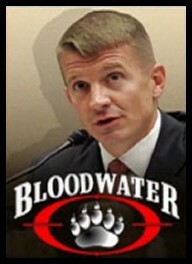 The five had been part of a 23 member Blackwater team known as Raven 23 who "submitted sworn written statements to the State Department using a form that included a guarantee that the statement and...evidence derived therefrom would not be used in a criminal proceeding against the signer," the court stated in its redacted opinion. The District Court dismissed the case on the grounds that the government had failed to prove that the evidence it was relying upon was not derived or affected by the immunized statements. The Court of Appeal ruled that the District court had erred by treating all of the evidence as tainted instead of conducting an independent, line-by-line analysis as to whether the evidence was independently obtained from other sources, including Iraqis present at the massacre, noting "when armed guards shoot a number of people in a crowd, it doesn't take Hercule Poirot to start wondering what the crowd was doing." If you use an AOL email address, AOL is doing you the favor of making sure you do not receive email containing any links to BradBlog.com in it. Not email from a BradBlog.com address, mind you, as if I were a spammer or something (which, obviously, I'm not), but any email from anybody that has a link to this site, or to one of our news stories. There is at least one URL or domain in your e-mail that is generating substantial complaints from AOL members. Resolution will require opening a support request. That's right, "substantial complaints" from someone, whatever that means, will result in no links to stories at The BRAD BLOG getting through to any of AOL's millions of members. And they will never know about it. Again, these are not even emails from BradBlog.com. They are simply emails from anybody to any AOL email address which has my domain linked in the body of the email. Neat, huh? I wonder what would happen if there were "substantial complaints from AOL members" about, say, FoxNews.com? Or MSNBC.com? Or NYTimes.com? Would that result in millions of members not being able to receive any email that links to anything at those sites? Sounds like a great way to ratfuck someone you don't care for politically, doesn't it? On Wednesday, Wisconsin's Asst. Attorney General JoAnne Kloppenburg announced that she will be exercising her right to file for a statewide "recount" following the April 5th election for state Supreme Court against the incumbent Justice David Prosser. She also said that she intended to ask for a special investigator to be named to look into a number of still-unanswered questions about election results that were misreported by Waukesha County's Clerk Kathy Nickolaus, a former employee of Prosser's when both served in the state's Assembly Republican Caucus. Kloppenburg's complaints have now been filed, and The BRAD BLOG has been reviewing both them, and several additional points of note since yesterday's dramatic presser, in advance of the count which is scheduled to begin next Wednesday, April 27, according to the WI Government Accountability Board (G.A.B. ), the state's top election agency. 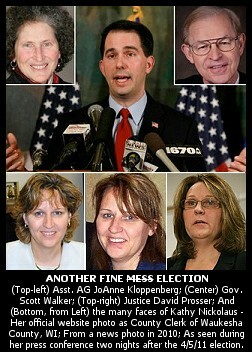 Details included in Kloppenburg's request for a special investigator in Waukesha --- including the curious point that Prosser "was observed entering the Governor's Office late in the evening and attending a private, one-on-one meeting with Governor Scott Walker" on the night following the election, on the very same day in which the controversial new GOP Governor publicly stated that there might be "ballots somewhere, somehow found out of the blue that weren't counted before." --- are certainly compelling. 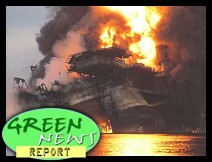 IN TODAY'S RADIO REPORT: It's hard to believe it's only been a year: Our not-at-all fond look back over 87 days of the BP Oil Disaster in the Gulf, and its aftermath ... PLUS: In honor of Earth Day, a message from the past about our shared future ... All that and more in today's Green News Report! One of my guests was WI's former union organizer, former state planner and former elected official Leslie "Buzz" Davis, a Kloppenburg supporter who spent some 20 minutes with her at her home last night, after she'd invited him in to chat when he went there to deliver 1000 signatures on a petition asking her to recount the state. I was also joined by Sarah Manski of WisconsinWave.org who, with her group and her husband Ben (who I worked with years ago during another recount, when he worked for the campaign of Green Party Presidential candidate David Cobb in 2004), is raising funds to support Kloppenburg's efforts.